I’ve been following an intention of self-care this lunar cycle (begun at the New Moon in Pisces on March 1*). We’re only halfway through this lunar month and it feels like it’s been four weeks instead of two. Self-care requires self-love; self-love is a hard road sometimes. You may have noticed this too. The self is vast. The self holds many stories and likes to tell them over and over to the self—stories of all types, some painful and some beautiful. The self is bliss—the mindful self is awake and alive to all the delights and wonders of the world. The self is small, sometimes feeling isolated and ineffectual. The self is transforming. In a world where the only constant is change, the self is always changing and noticing change. All this and more is here, inside the self, inside me. All this and more has been developing inside our selves since the spring of 2013 when the Sun entered Aries and began a new year. The astrological year, like the agricultural year, begins in spring. It is helpful to remember that our bodies still belong to the earth’s cycles and it is a big deal to let go of one entire year to make way for the next. It is a big deal to tend to the self, to empty and to cleanse from all that is held within the self so that a new cycle can begin. As the Rumi poem so beautifully says, “we wash ourselves of ourselves” in this Pisces season of letting go. Extricating all that is held within the self through self-care is not easy. It seems like it should be easy, but it isn’t. So, if you are feeling tender, like I am feeling tender at this halfway point in a cycle of self-care, at least you can know you aren’t alone. This work is important. This spring’s energies will be high, may be intense, and will certainly require us to be gentle with ourselves. We are not purging. We are releasing. The flow of water through planetary transits this week may help us remember that. 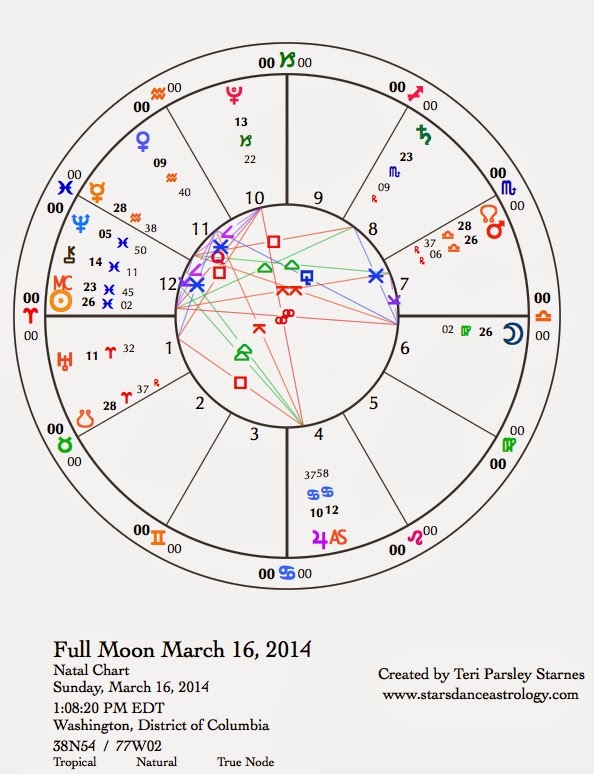 March 16—Full Moon: Illuminating. Pent up energy is often released at a Full Moon. Often, that is where the illumination comes from. With the energetic release, we suddenly understand something new or we are in new relationship to something old. We are at a culminating point for the intention of this lunar cycle of release and self-care. We need Virgo’s help (the sign of this Full Moon) to help integrate our Pisces experiences. These two signs complement each other by offering another side to the work of self-love. Both Virgo and Pisces are signs of devotion. In devotion, Pisces bends towards salvation; Virgo bends towards service. Pisces is good at losing the edges of self. Virgo is good at organizing them. Both can help us practice self-care. And done to the extreme, both can be destructive to self-care. Every Full Moon invites us to balance extremes. Big feelings may be present at this Full Moon. If you notice too much self-criticism, let Pisces remind you that the self if small and is redeemed through a larger perspective. If you are feeling disappointed in your ability to practice self-love, let Virgo help you place your feet back on the ground to take that next small step toward your goal. What we are doing now to create such balance in our lives will help with the transits of the coming spring. The aspect pattern between Jupiter, Uranus, and Pluto is getting more exact over the next month. We may notice our own stress or the stress of others increasing. Pragmatic compassion helps us to stay grounded in our lives and hearts. There’s a possibility we cross wires with someone we care about today. The Pisces Sun and Mars in Libra create a little friction. We may be angry that the other person isn’t more present or that our feelings are not being respected. The solution may be to remember you both want the same connection and just have different ways of getting there. Monday, March 17. Relationships continue to be a little touchy today. The Libra scales are being used to weigh the pros and cons in our partnerships. It is hard to compromise if you feel the other person isn’t doing the same. Venus in Aquarius makes a quincunx aspect to Jupiter in Cancer. This aspect heightens a sense of being from different planets. In reality, not everyone thinks the same way or wants the same things. We get to practice appreciating differences today. Take time to think over any rash responses you might want to make because Mercury enters Pisces and that can diffuse our ability to focus clearly. Mercury stays in Pisces for the next three weeks; use this time to release old thought patterns as we practice self-care in this Pisces lunar cycle. Another stressor today is that the Moon is triggering the aspect pattern between Jupiter, Uranus, and Pluto. What are you noticing about our changing world? What are your strategies for self-care? Tuesday, March 18. Look for people who delight you today—the odder, the better. Venus in Aquarius is happily interacting with Uranus (the ruler of Aquarius). Embrace difference! Find the comrades who support your causes. Form alliances that bring your visions forward. Break some rules and get away with it. You could feel the urge to break free of a confining relationship. Give yourself space to listen to what you really think. Wednesday, March 19. Today is the last day of winter (in the northern hemisphere). Are you ready to let it go? With the Moon in Scorpio, we could feel a little resistant to shedding winter layers even if we are tired to death of it. These layers can be metaphorical as well as literal. Winter is a time to go within; the movement back out can be disorienting. A good way to support this shift is to honor the internal experience you have had. It has transformed you. The Moon creates a Grand Water Trine with Mercury in Pisces, Neptune in Pisces, and Jupiter in Cancer. Go with the flow. Let water bring you the place of self-love. Cleansing and nourishing, water makes the way for Sun’s ingress into spring tomorrow. March 20—Disseminating Moon: Sharing. Spring Equinox. The momentum towards spring’s renewal kicks into gear, even though the lunar cycle asks us to continue to work the Pisces journey of self-care. Remember the goal is to release the old forms, to learn compassion for self in order to hold compassion for others, to tend our souls so we may have more strength and resilience as we begin a new astrological year. Under this phase of the Moon, we share the merits of our practice of following an intention. Whatever self-love we’ve remembered to shower upon ourselves, we now are able to share with others. What has the journey been like for you? What are the gifts? Our souls are like a prepared field waiting for the seeds of this practice to take root. How will you continue to tend these seeds, which still need so much before they begin to show the green of new life? 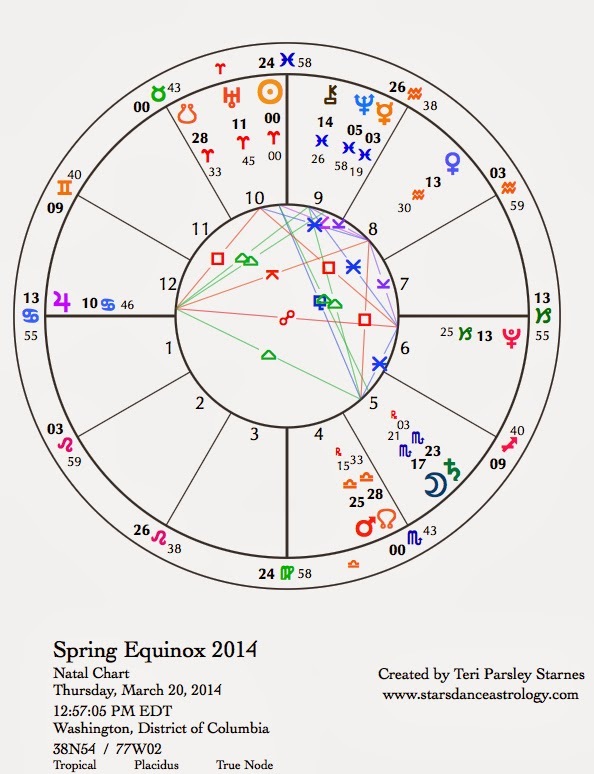 The chart for the vernal equinox is an important one for astrological purposes. This is the chart to consider when looking ahead at the upcoming challenges for a nation. The chart for the equinox, set for Washington, D.C. shows Jupiter on the Ascendant opposed by Pluto on the Descendant. These planets showing up in this position mean that we will experience these two planets strongly over the next year. On the one hand, Jupiter can bring good fortune, on the other, being opposite Pluto, we also may experience big transformations. In addition, the Ascendant is at the exact degree of the Sun in our nation’s own birth chart. This same degree will be transited by a grand cross of planets in April, reinforcing the idea that big change and big energy is in store for us this year. The best way to work with Pluto transits is to honor our shadows, to be willing to look at our deeper issues, and to engage in the soul work of transformation. All this is possible for us collectively too. It is time to see with clear eyes and to affirm the right use of power—to apply ourselves to transforming culture so it can be more whole and more life sustaining. All this is possible with a Pluto transit. As we stand on this day, balanced between light and dark, let us invite the courage and clarity we need to see within the shadows and into the light of our visions. Friday, March 21. We are in the foggy zone of Mercury approaching Neptune, and the Moon today doesn’t help as it is square to these two planets. We feel flashes of insight that may just as suddenly disappear. With that in mind, give yourself a lot of extra time and space to get things done. It is a good idea to be extra careful when driving. On the other hand, we can enjoy activities that are less focused on productivity and more focused on enjoyment. Your imagination wants to roam. Let it have a vacation. You might be surprised what it brings back from its travels. Saturday, March 22. Yesterday’s imagination journey supports spiritual states of mysticism, transcendence, and ecstasy today. You are getting messages. I can’t say they will all be correct. Remember the lessons of the Full Moon. What illumination did you receive about balancing pragmatism with compassion? That discernment could help you sort out fantasy from enlightenment today. Venus reaches its greatest elongation from the Sun in its current cycle as the Morning Star. That means Venus is as high in the sky as it will get before sunrise during this part of the Venus journey. If you get up early, look for the bright light of Venus. In Aquarius, Venus is adding hope to relationships that create more freedom, more authenticity, and more possibilities. She blesses our visions for the future.